Over the past 25 years, Genote studied music’s role in helping people manage and overcome a variety of issues including sleeplessness, stress, anxiety, and pain. 400 elements of music have been identified and are now engineered to achieve remarkably focused results — sound sleep, lower anxiety and stress, etc. Our original music library of over 1500 compositions is called Health Music. Sleep is at the very core of our health. By listening to Genote before going to bed, we can significantly improve sleep quality, sleep consistency, and make falling asleep effortless. Clear your mind. Improve your cognitive performance when your best skills are needed. Genote expedites academic or work tasks by optimizing cognitive functions, facilitating a clear state of mind, and inducing better focus. Life can be overwhelming producing anxiety and stress. Genote helps normalize breathing patterns, heart rate, and blood pressure while improving a sense of calmness and the ability to cope. Create a dedicated sound environment for your mind and body to speed up the recovery process and normalize key health parameters. Genote increases the therapeutic value of rehabilitative regimens. Sign up, choose your Area, and connect to your Health Music. Launch your 30-minute Health Music. Follow the promptings, concentrate on the sound and rhythm. Clear your mind, focus on the present, and let Genote take you away. Genote therapeutic music technology is based on the latest research that applies state of the art sound and music analysis to offer non-invasive individual health solutions. The benefits of Genote are experienced in homes, schools, the workplace, and medical facilities. The unique Genote process of customization takes into consideration thousands of musical, physiological and psychological parameters. Genote Health Music protocols are created with customized music compositions, catalogued and ordered according to evidence-based findings. Each Health Music protocol is tailored to specific therapeutic objectives. Sound quality is taken seriously at Genote. Years of engineering development have been coupled with universally recognized best performance and recording practices. The purest sound available on the Web is captured by world class engineering and made available through the Genote. No other music analysis process has been standardized through clinical projects in multiple hospital, clinics, and educational institutions. 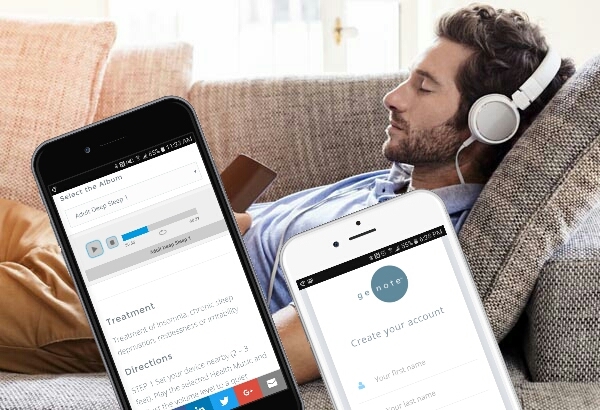 Years of research, side by side with physicians, psychologists, and musicians have allowed Genote to develop Health Music protocols designed for specific target outcomes. All types of music have been analyzed, tested and adopted in clinical settings. Compositions from the XII century to the modern era including Classical, Jazz, Folk and Modern, constitute the original Genote Library. International artists, composers and performers alike, have joined Genote by creating and interpreting old and new compositions. How do I know how to use Genote? What can I expect by signing up? How is the music chosen? The Genote music analysis process captures and optimizes how music and sounds can positively effect health conditions and well-being. Its new technology was developed through years of research and testing with medical and music professionals in Europe and the United States. *Data shown are based on recorded, cumulative, average results of behavioral states observations independently analyzed by a third-party. "Genote helps me stay really calm and decompress from my daily training." "If there is a night he falls asleep with out the music, he'll wake up grouchy." "He didn't sleep well at all and was waking up a lot in the middle of the night." Free trial. No credit card required. You decide if you want to continue.